There are 8 bike-related talks and events on the SXSW Schedule this year. A casual, social meet-up for Cyclocross riders from across the country to get together and discuss dirt, #svenness, and cool bikes. Everyone will be able to discuss what Cyclocross is like in their specific area of the world and what they have done to grow the sport. Optional CX ride after the meet-up to Mckinney Falls State Park. Enjoy a daily commute, joy ride with friends, #NewKitDay or year-round racing? Join fellow badass female cyclists and the men who support us. What has traditionally been known as a male-dominated sport is slowing seeing a rise in attendance and appreciation from women. It’s about time. Led by SXSW Interactive Publicist and cyclist, Kelly Krause, this Meet Up is for those with a passion for bikes and getting more women on them. The face of urban bicycling is in a rapid rate of change. From better apparel to constantly improving bike lanes, more and more people are taking to the streets on two wheels. Join this diverse panel featuring perspectives from all over bike culture for a discussion on how urban bicycling goes from fringe to fashion. Come talk about the latest in cycling technology from road racing wonderbikes, to advanced suspension design, to e-bikes built for the super commuter. See the latest from some of the tech firms working on cycling accessories and talk with like-minded folks about the future of all aspects of cycling, racing to commuting, smart bikes to mountain bikes, and more. In an age where consumer brands are racing to establish a digital storefront to replace their expensive physical locations, Rapha and Design Within Reach are going about it the old fashioned way. Building community and relationships with the consumer is paramount. Online content, mobile applications, and social media are best used to supplement these real world relationships and experiences. Having spent a career making interesting content on the independent web, since the beginning, no matter where you are in the process of pursuing your dreams in interactive, Byron trod the path before you and will help you tackle the next steps. 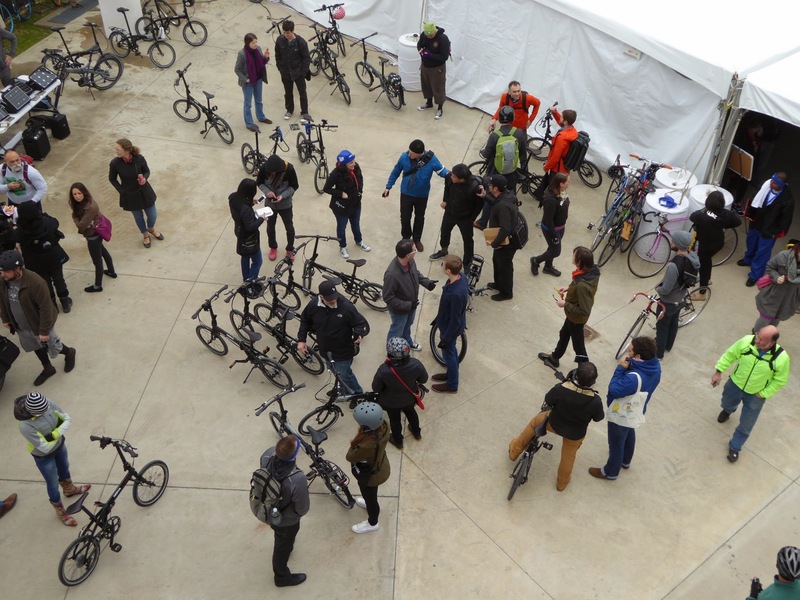 At Create, in the space where bikes and tech meet, we’ll greet filmmakers, city planners, and advocates. After that we’ll ride to watch the world premier of the film Bikes vs. Cars at Republic Square Park. Bikes vs Cars depicts a global crisis we must talk about: Climate, earth’s resources, cities where the surface is consumed by cars. The bike is a great tool for change, but the interests who gain from cars invest billions each year on lobby and ads to protect their business. That’s amazing in itself AND for our 9th annual Mobile Social we’ve refocused to advocacy and the world premier of the film Bikes vs Cars. The ride and meetup starts at 3:30 on 3/15 and then we’ll ride to the movie at Republic Square Park. RSVP now on Facebook or G+. Have a look at last year’s gallery….